As a mother of three, there is a lot to be done around the house! Thankfully I have three eager and able sets of little hands that like to jump in and help out! But each one is a different age, and they each have different strengths. So I take that into consideration before asking for their involvement or assigning their tasks. Not only is having a little extra help around the house nice, but it is also an important element of parenting. Teaching our children to be responsible, and allowing them to become more independent, will help them later on in life. It also makes them more appreciative for the work that you, or even others, do for them. And once they help clean up their playroom a few times (ok, maybe several dozen times), they will hopefully become more contentious about cleaning up when they are done. They will be more aware of the time that goes into prepping food and cooking dinner – and hopefully will finish their plate without complaint. They will try harder to keep the family room tidy, not throw clothes in the laundry that aren’t really dirty, and avoid turning the bathroom into a disaster while getting ready for school. It may take a lot of time, and repeat of these chores, but eventually it will click. Eventually they will try to save you time and energy from cleaning up their messes. Eventually, your house will be spotless, and eventually you will not have little ones running through your halls anymore (I am dreading that day!). So enjoy this phase, and enjoy the journey of teaching your children how to grow into mature human beings that show respect and appreciation. 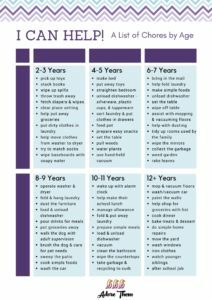 Below is a breakdown of possible chores by age. Some children might be ready for added responsibility earlier, and some may not be able to handle specific tasks until they are older and more developed. So please do not go by what is listed below – but instead use it as a guide, and then tweak it to what works best for you, your children, and your family as a whole.